Have a basic GraphQL server which will work as a foundation for a more complex server. Have a basic understanding of the fundamental GraphQL principles. 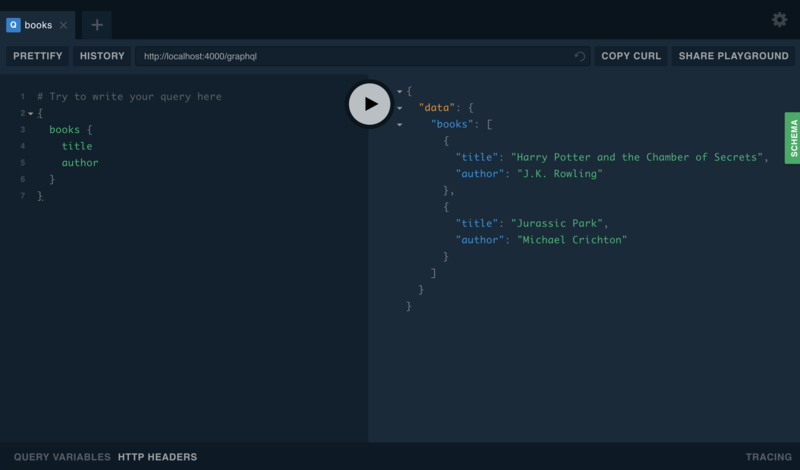 Be able to send a query to the new GraphQL server and see the response using GraphQL Playground. If you want to skip walking through the steps, the More information section at the bottom has a link to a GitHub repository which can be cloned and run locally, and a Glitch to play around in your browser! First, create a folder called graphql-server-example using the mkdir command. Enter the directory, so the remaining work will take place within that directory. Initialize the new directory as a Node.js project using the Node.js package manager, npm. We use npm, the default package manager which ships with Node.js. Other package managers, such as Yarn, offer similar functionality, but will not be covered in this guide. If the above steps all completed successfully, there should be a new package.json file in the directory. You can verify this by running ls (list files). apollo-server: The Apollo server library which allows you to focus on defining the shape of your data and how to fetch it. graphql: The library used to build a schema and to execute queries on that schema. Note: There won't be any usage of the graphql package in this guide, but it is required to be installed separately as it's an important "peer dependency" of Apollo Server. While you could write all of the necessary code yourself, these two dependencies make it easier to build a GraphQL server and are common in applications of all sizes. In the next step, we'll use these dependencies to create a server which processes and responds to incoming GraphQL requests. In this step, we'll provide a code block which sets up apollo-server to respond to an incoming GraphQL request. In order to move along quickly, we'll have you copy and paste the code into an index.js file in your project. When looking at the code, we hope you'll find the comments helpful in understanding the core GraphQL concepts. Don't worry if there is something which needs more explanation; we'll point you to the right places for more details at the end of this guide. The example code will utilize a static collection of two books. In a more complicated example, the books might be fetched from a web resource (e.g. Amazon or a local library's website) or a database (e.g. MySQL or MongoDB). Using an IDE/editor, open the graphql-server-example directory which we created in the first step. Create a new, blank file called index.js in the root of the project directory. // from an existing data source like a REST API or database. // which ways the data can be fetched from the GraphQL server. # Comments in GraphQL are defined with the hash (#) symbol. # This "Book" type can be used in other type declarations. # The "Query" type is the root of all GraphQL queries. // schema. We'll retrieve books from the "books" array above. // responsible for fetching the data for those types. // can utilize middleware options, which we'll discuss later. The code above includes everything that is necessary to get this basic GraphQL server running. In the next step, we'll start the server so it's ready to respond to requests! For this step, we'll return to the terminal/console and start the server we defined in the previous steps. Open the address provided in your web browser. 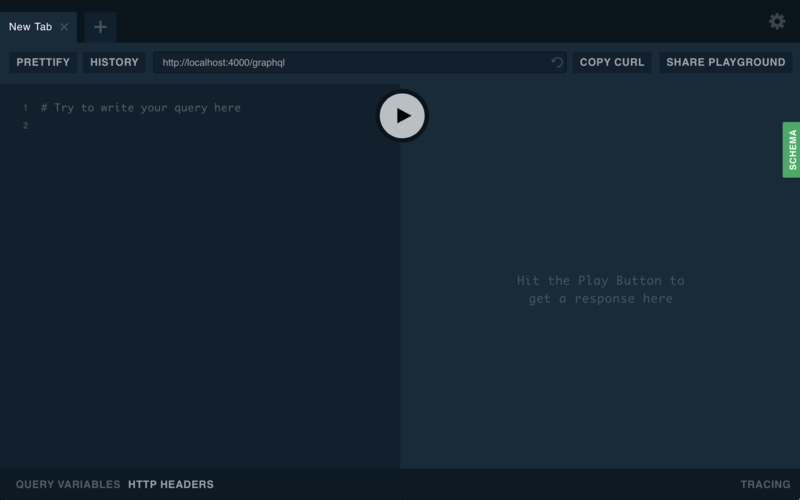 If everything is working, you should see the GraphQL Playground explorer tool, which we will use in the next step. In the next step, we'll use the GraphQL Playground tool to send queries to the GraphQL server. Since we're trying to obtain books, we can enter the following query on the left side of the window. This query asks for a list of books, including the title and author for each book. Adding Apollo Server to an existing app. It's also possible to play with this example on Glitch, by remixing the repository.